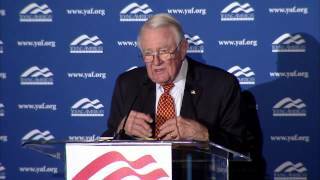 Edwin Meese III holds the Ronald Reagan Chair in Public Policy at The Heritage Foundation, a Washington-based public policy research and education institution, where he is responsible for keeping the late president’s legacy of conservative principles alive in public debate and discourse. He also is Chairman of Heritage’s Center for Legal and Judicial Studies, founded in 2001 to educate government officials, the media and the public about the Constitution, legal principles, and how they affect public policy. He is also a Distinguished Visiting Fellow at the Hoover Institution, Stanford University, California, and a Distinguished Senior Fellow at The University of London’s Institute of United States Studies. In addition, Meese lectures, writes, and consults throughout the United States on a variety of subjects. Meese is the author of With Reagan: The Inside Story, which was published by Regnery Gateway in June 1992, and is co-editor of Making America Safer, published in 1997 by The Heritage Foundation. Meese served as the 75th Attorney General of the United States from February 1985 to August 1988. As the Nation’s Chief Law Enforcement Officer, he directed the Department of Justice and led international efforts to combat terrorism, drug trafficking and organized crime. From January 1981 to February 1985, Meese held the position of Counsellor to the President, the senior position on the White House Staff, where he functioned as the President’s Chief policy advisor. As Attorney General and as Counsellor, Meese was a member of the President’s Cabinet and the National Security Council. He served as Chairman of the Domestic Policy Council and of the National Drug Policy Board. Meese headed the President-elect’s transition effort following the November 1980 election. During the Presidential campaign, he served as Chief of Staff and Senior Issues Advisor for the Reagan-Bush Committee. As Reagan’s chief of staff, Meese was instrumental in the decision to crack down on student protesters at People’s Park in Berkeley, California, on May 15, 1969. Formerly, Meese served as Governor Reagan’s Executive Assistant and Chief of Staff in California from 1969 through 1974 and as Legal Affairs Secretary from 1967 through 1968. Before joining Governor Reagan’s staff in 1967, Meese served as Deputy District Attorney in Alameda County, California. From 1977 to 1981, Meese was a professor of Law at the University of San Diego, where he also was Director of the Center for Criminal Justice Policy and Management. In addition to his background as a lawyer, educator and public official, Meese has been a business executive in the aerospace and transportation industry, serving as Vice President for Administration of Rohr Industries, Inc. in Chula Vista, California. He left Rohr to return to the practice of law, engaging in corporate and general legal work in San Diego County. Meese is a graduate of Yale University, Class of 1953, and holds a law degree from the University of California at Berkeley. He is a retired Colonel in the United States Army Reserve. He is active in numerous civic and educational organizations and currently serves on the boards of the Landmark Legal Foundation, the Capital Research Center, and the National College of District Attorneys, and is the Chairman of the governing board of George Mason University in Northern Virginia. Meese is married, has two grown children, and resides in McLean, Virginia.